Exiled opposition leader and multimillionaire Moise Katumbi will not attempt to land in DR. Congo after his private jet has been barred from landing on Friday in Lubumbashi, capital of Katanga Province. The political heavyweight will instead try to enter via Zambia, his party said Friday. The 53-year-old former governor of the mineral-rich province has been living in self-imposed exile in Belgium since May 2016 after falling out with President Joseph Kabila. He had planned to fly from Johannesburg to his former stronghold of Lubumbashi to stand in long-delayed December elections in the central African nation. Katumbi is also on trial for supposedly hiring mercenaries and for possessing an Italian passport as Congolese law does not allow double nationality. 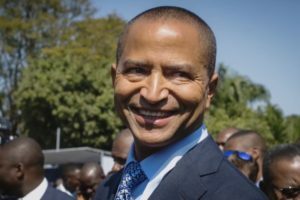 Aides to Katumbi had met earlier on Thursday with United Nations officials to discuss his return, sources said. Both Katumbi, born to a Greek businessman father and a Congolese mother, and Kabila hail from Katanga. They were once allies. Another rival of long-serving President Joseph Kabila, Ex-rebel leader Jean-Pierre Bemba on Thursday officially launched his bid for the country’s presidency, putting forward his candidacy for the long-delayed election. The 55-year-old, also a former DRC vice president, only arrived back in the country on Wednesday after 11 years abroad – a decade of it behind bars. Posted by Geraldine Boechat on August 3, 2018. Filed under Zoom. You can follow any responses to this entry through the RSS 2.0. Both comments and pings are currently closed.